The US Dept. of Education Office of Civil Rights (OCR) has issued a blistering report detailing how white special education students have been placed in different settings than Black and Latino students with similar disabilities. The OCR initiated an investigation based on a complaint by Willie Trotman, President of the NAACP Spring Valley Branch. Who is holding accountable those who initiated and implemented these policies? Advocates for Justice, that’s who! You do not know me… not that you would have ever cared to know me, or for that matter any East Ramapo student. You have seen me many times however. I have shaken your hand at numerous ceremonies where you would stop by and say a 3-4 minute improvised speech and leave right after its ending. At the award ceremonies, you would tell the recipients to excel but you never gave us the resources to do so. You would call us intelligent and bright but what I think was truly bright was your decision to resign. The community and I thank you immensely. Thank you for finally listening to us. If I may, I suggest you take the Board of Education with you. 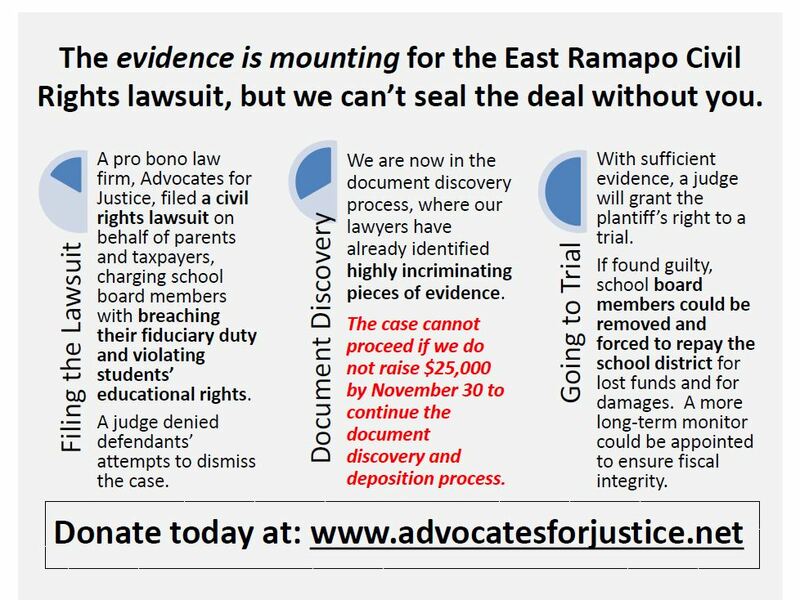 I am happy that you realized that you are up against a strong and powerful community that will not quit until justice is served to every student in East Ramapo. You will not be missed. Are the state appointed monitors to the East Ramapo school district doing a good job? What exactly have they been asked to do? They were assigned to the district when the NY State Senate failed to pass a bill appointing a monitor with power. The response of the NY Education Commissioner was to appoint a team of monitors without power, but with expertise. They are keeping us appraised of their actions via a wordpress weblog. Now the community has had a chance to meet the monitors and the new superintendent of schools, and I think they have shown themselves to be likable, professional, courteous and competent. According to their weblog, they have been charged with providing on-demand technical assistance to the administration, entering in dialog with both the board and the public, and producing updates and reports to the commissioner and the public. There is no question that the monitors have engaged in meaningful dialog and engaged the community. They produced a PowerPoint presentation summarizing information about issues in the district. Together with the new superintendent they seem to be creating plans that will improve the educational experience of the children in the district, and they should be commended for that. However, this district has an underlying foundation of deceit and mistrust, upon which they are erecting their new edifice of education. Like so many buildings in the area, this one appears to have been rushed through the planning department. A failure to properly survey can result in building your castle on quicksand. 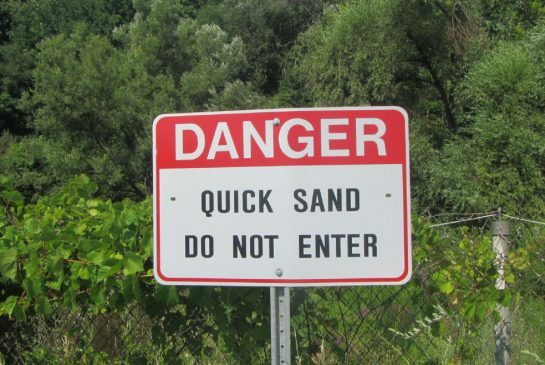 The quicksand in this area is the ease with which a school board can pull the rug out from under us. In 2009, Superintendent Oustacher revealed a plan to close one or two elementary schools and use the savings to fund full-day Kindergarten for all. The commitment to Kindergarten was not on a solid foundation, but the drive to close the schools was. Later, both schools were sold to yeshivas, but full-day K was eliminated. The house that Oustacher built sank into the sand. It wasn’t the first time. Before Oustacher, there was a deal that kept East Ramapo’s budgets in the black. The school superintendent and board (then dominated by public school advocates) promised to ignore neglect of education in yeshivas and in return the yeshiva parents would not vote down the budgets of the public schools. That house of cards came crashing down in 2005 when massive turnout from New Square, Monsey and Kaser knocked off board members Georgine Hyde and Dr. Danielle Bright. The monitors have assessed fiscal and educational outcomes, but they have misunderstood (so far) the social and racial underpinnings of the crisis. Just as the monitors have assessed and reported on aspects of education and fiscal problems, they could also assess and report on the social, racial and class conflict which is at the root of those problems. But they will have to open their eyes first. Even when the US Department of Education Office of Civil Rights issued a report confirming the NAACP allegations of disparate treatments of students by race, Monitor Walcott says he “still didn’t really see” it. It is not impossible for the monitors to apply the same professionalism in understanding racial and social issues as they do for educational and operational issues. It is very disappointing to see the problem framed as “centrists” vs. “extremists”, with no data to support that hypothesis. Both collaboration and confrontation have been tried, but because neither has addressed the underlying inequalities of power, they have failed equally. Without a valid assessment, the plans are doomed. Being colorblind is an impairment to seeing the true nature of the relationships. For instance, many of the Latino parents work as laborers for families that use yeshivas. Many have difficult working conditions and low pay. Also, much of the housing they live in is owned by businessmen from the ultra-Orthodox community. The rents are high, the living conditions are substandard and even dangerous, and they are bullied by the landlords with threats of eviction if they speak up. Much of Spring Valley is essentially a labor camp. It is not surprising to see that the dominant group is not enthusiastic to educate the children of their servants. Has it ever not been so? Ignoring the intricate socioeconomic relationships of the two groups and claiming not to see discrimination or inequality will severely hamper an accurate assessment of the nature of the problem. We do not expect the monitors appointed by the education department to solve every problem. They are really only charged with observing and reporting on educational and operational practices. However, they are able to accomplish some important things for our children and for that we are grateful. It is our sincere hope that their future reports will also address the inequalities created by our unique style of segregation and the impact of the rule of a Not so Simple Majority.